We tend to characterize buildings as static, permanent. In reality, they can tell a story as rich and complex as the lives we live. The iconic Puck Building is a prime example of a structure that has morphed, evolved, grown, and even defied some seemingly dangerous odds. 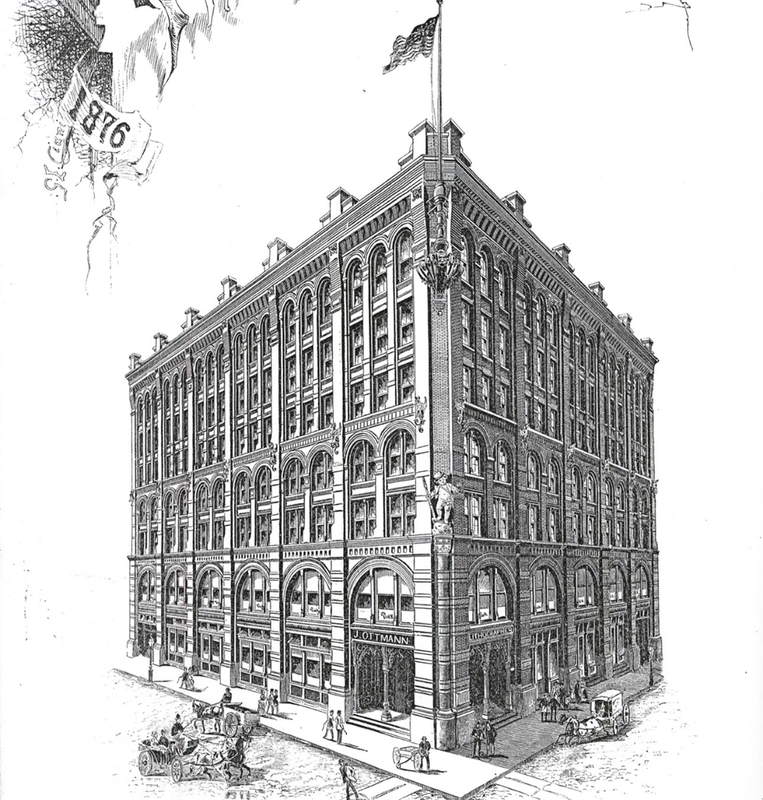 Built in 1885, the original Puck Building was a square 7-story wood-framed corner lot building. The state-of-the art facility allowed the satirical publication, Puck Magazine to print its iconic political cartoons in full color lithographs for widespread publication. The magazine’s growing popularity spurred a major addition in 1892. Designed by the same Architect, Albert Wagner, the 9-story addition replicated the patterning of the existing Romanesque Revival façade. But inside the annex utilized all of the latest building technologies: cast iron structure, brick ceiling vaults for fireproof construction, and some of the city’s first passenger and freight elevators. Corner of Houston and Mulberry, c. 1892. 7 years later, in 1899, Wagner sharpened his pencils yet again to design the building’s now iconic main facade. The city’s plan to connect Lafayette Place with Elm Street cut right through the building’s two most western bays. The west façade, which had always been a lot line condition, now became the building’s most visible presence. A second “Puck” statue was added above the new main entrance. Puck’s growth and loss in its first 14 years. By 1918, Puck Magazine had stopped publication. The printing company, J. Ottman, continued to occupy the site as well as several other publications, including Spy Magazine in the 1970’s and 80’s. Around the middle of the 20th century, the crenellated parapets along the original 7-story portion had deteriorated and were removed. As the publishing companies vacated toward the end of the 20th century, the upper floors continued to be used as office space while the ground floor was rented out as prime event space. In 2011, plans to reinvigorate the Puck Building began. The often vacant ground floor event spaces were converted into retail space, expanding on the bustling streetscape of the adjacent SoHo district. PKSB was brought on as Architect and Landmarks liaison for a residential rooftop addition. PKSB coordinated with Interior Architect Jose Ramirez on six unique residences. Restoration of the lower roof parapets was key to the approval of the rooftop addition as the tall parapets and crenellations help to mask the view of the addition from the street. Though minimally visible, the addition allowed for several upgrades to the 130 year old structure. All of the building’s five elevators were replaced or upgraded. Outdated building systems were brought up to modern day, more efficient standards. A green roof system was installed on the building’s low roof and the parapets were structurally reinforced and stabilized. Puck’s latest reinvention is coming to a close, but with the ground floor now established as retail, the streetscape will be in constant flux…Foodies should look out for an exciting new dining experience scheduled to open later this year. The Food and Wine sponsored restaurant will feature rotating Chefs from some of the city’s finest establishments. Restored parapets and green roof system visible from the rooftop.